Regtransfers was established in 1982 by Tony Brown, and has since grown into a dynamic company employing more than 100 people. Regtransfers was one of the first independent cherished registration specialist companies formed in the UK. It is now the largest, both in terms of the number of employees and of its unrivalled stock of exclusive, top quality registrations. Regtransfers offers a range of products and services that no other private number plates company can equal, as well as unrivalled professionalism and specialist expertise. The following retrospective appeared in issue 29 of Regtransfers: The World of Personal Number Plates. In 1982 a Vauxhall Motors engineering apprentice named Tony Brown decided that employment prospects at the end of his apprenticeship were not looking too good, so he began to explore the possibility of starting a business of his own. The first few efforts proved less than successful, but Tony continued to look for inspiration - which he found among the pages of Exchange & Mart. "I came across people advertising cherished number plates for sale. At the time I had no idea this could be a viable business, but the more I looked into it the more I became interested and fascinated by the whole subject. The early days of the business were a strange mixture: very interesting, but also worrying, lonely and hard work. I had no idea what was involved in running a business and had no mentor or person I could really speak to about it." The business grew slowly initially as Tony had very little money to spend on marketing. "I had to resort to literally running around wealthy places like St John's Wood in London, placing cards on old vehicles such as Morris Minors asking whether the owners wanted to sell their number plates. Then I would place other cards on the higher-end cars like Rolls-Royces and Bentleys asking whether those owners wanted to buy a personal number. When I was finished I would drive back to my flat in Luton, hopefully to take phone calls generated by my day's legwork. As it turned out, this process was quite a good way of getting numbers to sell. On the other hand, I found that I needed to reach a bigger audience in order to find buyers, so I started to put small adverts in Exchange and Mart and the local press. When I first started I was very inexperienced and naive. I never actually received payment for the first few numbers numbers I thought I had sold. The customers just never sent me the money. Looking back I realise that the documentation I sent them was very unprofessional and certainly not good enough to give people confidence to send me the necessary documents and a large amount of money. I soon learned that everything had to be done properly and professionally. Another lesson I learned at that time was not to rush into things. When I thought I had sold those first few numbers I handed in my notice at Vauxhall. When the sales never completed, things were a little uncomfortable for a while. I remember the very first number that I successfully sold and transferred - and got paid for! The registration included the numbers 356, and the customer bought it for an old Porsche 356 Speedster that he was restoring. The first big number I sold was B 1. It was only after selling this number that I realised how prestigious some numbers could be, and the value that some people attached to their ultimate personal registration number. The sale of B 1 was achieved following a phone call from a gentleman who called from Saudi Arabia. The customer, whose name began with a 'B', had seen an advert that I had placed in the Sunday Times. He wanted to know if I could secure B 1 for him. To cut a long story short, the lady who owned the number at that time had inherited it from her father. She had moved to the Isle of Man for tax reasons and had decided that she would sell the number if she could get £30,000 for it. To put this into perspective, I had been earning approximately £5,000 a year when I left Vauxhall. £30,000 was a huge amount of money to me, and I really thought that no one in their right mind would buy a car registration at that price. I was wrong. Even with my profit margin added, Mr B was delighted. He bought the number immediately and I learned another valuable lesson. In the 30 years since those small beginnings I have seen incredible changes. When I started out, computers were in their infancy and very expensive. It was about two years before the business could afford to buy a computer. The first one was a nice Apricot computer that cost £2500! Before that we relied on card index systems, which meant that people had to stay on the phone for a very long time while we went from file to file checking which numbers were available. Of course, this also meant holding the phone clamped against your neck between shoulder and ear, which wasn't very comfortable. When the business started in 1982 there were very few number plates available on the market. That changed once the DVLA realised the potential and got involved in selling registrations in 1989. The two biggest game-changers over the years have been that involvement of the DVLA in selling number plates, and the invention of the internet. We embraced both of these changes and looked upon them as challenges that would help us grow, which I think they have. Regtransfers has become the leader in the independent number plates market. We have also become a major source of information on the subject, publishing books and magazines and advising newspapers and television, radio and film companies. We have flourished by treating each new challenge as an opportunity and, most of all, by taking the best possible care of the customers upon whom we depend for our survival. This is how we will continue to expand, improve and lead." Regtransfers is the publisher of Regtransfers: The World of Personal Number Plates, the UK's only free, full colour, professional magazine for the personal number plates industry and enthusiasts. 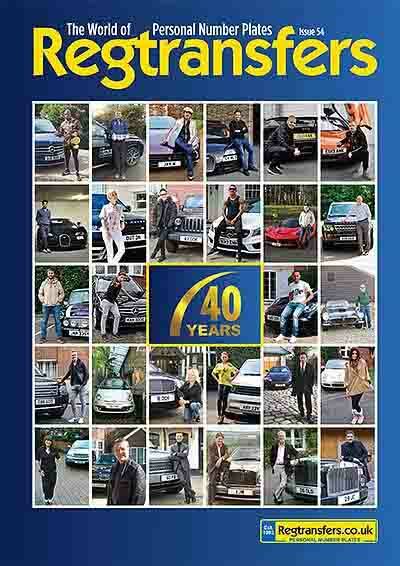 Each issue of our magazine features celebrity interviews and a range of number plates articles and information. It also includes categorised listings of the best personal number plates currently available in the UK. The magazine's quality and appeal is reflected in the demand it generates: circulation is currently over 300,000 per issue. Regtransfers is the UK's leading adviser to business on the benefits of private number plates for marketing, branding and investment. We are also the company that the celebrities trust with their business. From musicians and movie stars to athletes and the country's top business people, Regtransfers.co.uk caters to the requirements of your favourite celebrities. Many of our famous clients have kindly provided testimonials, and we are very grateful to those who have spared their valuable time to give interviews for our magazine. Russell Watson, James Caan, Vanessa-Mae, James Martin, Ian Botham, David Gold, Frankie Dettori, Phil Tufnell, Coleen Nolan, David Haye, Stacey Solomon, Duncan Bannatyne, Amir Khan, Theo Paphitis, Sir Stirling Moss, Vinnie Jones, Paul Daniels, Nicky Clarke, Linda Lusardi, John Madejski, Chris Tarrant, Engelbert Humperdinck, and many more.